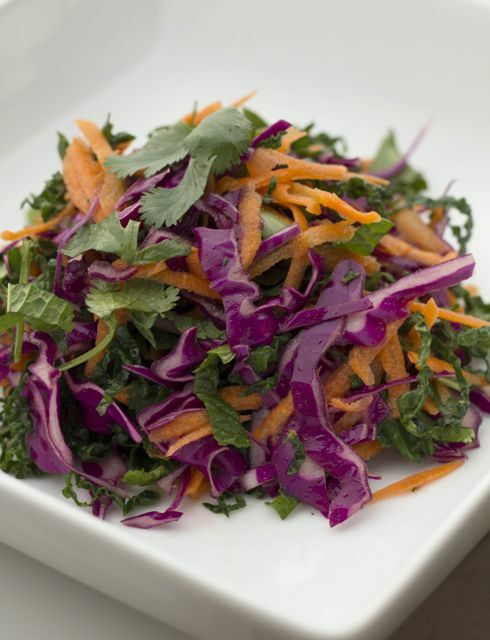 Whole Foods- Detox Fresh Herb and Red Cabbage SaladI can't say enough about this salad, it's one of the most nutrient dense salads you can eat on a regular basis. I could have added many ingredients to this salad but I wanted to keep it simple and easy. The raw enzymes help increase chemical reactions in the body and there is purpose behind every other whole foods ingredient, so lets start with the vinaigrette. The vinaigrette contains apple cider vinegar. Besides it's alkalizing properties, it also helps increase hydrochloric acid in the stomach; thus helping break down your food so that nutrients can be properly absorbed into the body. The fresh lemon juice also helps with digestive health, but it also helps alkalize the body; the body should be more alkalized in general than acidic. Disease grows in an acidic environment. The organic extra virgin olive oil contains healthy fats that our bodies need in order to digest the fat soluble vitamins contained in this beautiful salad. Fresh herbs in general taste delicious, but they also contain large amounts of chlorophyll which help detoxify toxins from your body. The cabbage contains specific sulfur compounds that increase glutathione activity; glutathione is needed by the liver to detoxify toxins. Our liver is our detox organ, we must keep our liver as clean and as healthy as possible in order to bring homeostasis back to our bodies. The carrots contain a wonderful amount of vitamin A; needed for healthy eye sight and a strong immune system. The kale and other vegetables of course, contain fiber which is needed for proper elimination of toxins through the bowel. With all of that said, I think you get my point that this is really, really good for you. Let's not forget that it actually tastes delicious, and as always, it's very simple to make. Great way to practice your knife skills!